THE Australasian winners of the 2017 Syngenta Growth Awards were announced at a gala dinner in Sydney last night, acknowledging their outstanding efforts to pursue a more sustainable future for agriculture. Now in its fourth year, the Syngenta Growth Awards recognise individual achievements in agricultural productivity, sustainability and commitment to community and people. 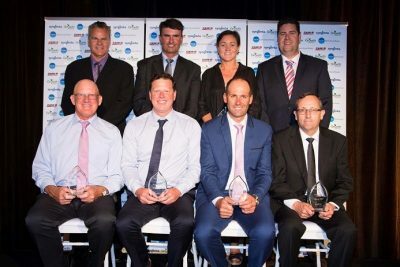 Syngenta territory head – Australasia, Paul Luxton, said the eight Australasian winners represented the very best of Australian and New Zealand growers and advisers. “The Syngenta Growth Award winners have been chosen from across the spectrum for their strong passion for agriculture and challenging complacency in our industry,” Mr Luxton said. The eight Australasian winners were chosen from a pool of 25 regional winners by an independent judging panel and were selected based on a set of rigorous criteria for each category, including their overall contribution to the industry. With such strong competition in this year’s Awards, the judges selected two joint winners of the Adviser Productivity Award for the first time in Growth Awards history. “The judging was a very challenging task given the high calibre of nominees for the 2017 Syngenta Growth Awards. We are proud to celebrate the forward-thinking and innovative practices of our winners,” Mr Luxton said. The eight winners will now have the opportunity to participate in an industry-leading study tour to the United Kingdom and Europe next year. The Growth Awards are presented by Syngenta in partnership with Case IH and Fairfax Agricultural Media.